Third eye - how to activate the pineal gland? In the human body there are energy centers, marked as chakras, and one of the chakras located in the center of the brows is the third eye. The third eye is the chakra, whose branches extend to the root of the nose and towards the central part of the forehead. It belongs to the energy body and is not visible to the human eye. The pineal gland is the endocrine gland in the human body, which really exists, but it is mostly inactive or dormant during human life. The sizes are grains of pea, smeared like grain of dry grapes. Why is it said that the pineal gland is sleepy? In earlier times, a philosophers and scientists in the 18th and 19th centuries, character the pineal gland as the subject of research, connecting it with the soul, and it was considered a gate of the soul, through which it can penetrate deeper into the inner beings. It was considered that by coming to the world, until then the active pineal gland atrophies, its function is extinguished, in order to break the spiritual connection between God and man, and so that man would lead a material life without recollection of what he was before material life. One word, pineal gland or third eye, was the spiritual bond of man with the divine. Connection of the soul with the source. The third eye is part of the energetic body that surrounds the physical body. Although invisible to our eyes, it is present and with it there is a third eye. During the childhood, especially 0-5 years of life, the third eye is especially pronounced and awakened, although as children we do not understand it. This is reflected in the carelessness, the life, the happiness, the feeling of comfort, which we perceive as children quite normal for that age, but it is actually the coincidence of our physical existence with the spiritual and our own self. At this stage, the subconscious is dominant, which will always be present in a person, but it is dormant, until shadow work and balance of ID, EGO, and SUPER EGO are implemented. Later, from 6 to 25 ages, when a person enters the stage of puberty, a change in both the hormonal, metabolic, mental and emotional levels and the third eye starts to settle down and loses its fiction - the connection with the divine. In this period, there are not rare occurrences of mental states, mood swings, depression, anxiety, and all these are signs of losing connection with higher self and attachment to materialism and Ego. The third eye is the center of our intuition and imagination. These are our door to a higher self, towards spirituality, immaterialism. When the third eye is closed, we are the adversaries of Ego; we are guided by realistic impressions, which separate us from the true, spiritual reality. When the third eye is open, it is easy for our eyes to be just like everyone else heard. Our imagination, intuition, our subconscious mind wakes and in some people it results in the emergence of visions, talents, and psychic powers. Is the opening of the third eye a spontaneous procedure or is meditation conducted? The opening of the third eye should not be considered as a program or as a routine. The opening of the third eye is a spontaneous process, which will appear it and you will feel the need to reconcile with your own high being and open the gates of your soul. This procedure should never be regarded as harmless, but as a special approach, in which we will be left to the leadership of an experienced practitioner. You never do this alone, especially if you have not yet been raised spiritually and enlightened. Opening the third eye cannot be performed if the other chakras in the body are not balanced. It is necessary to open ourselves first to spirituality, to enlightenment, to the higher Self, to develop a feeling of unconditional love with you, to procrastinate your physical body and clear your mind. The opening of the third eye can sometimes be a spontaneous process, and sometimes requires a long lasting and consistent application. • We will use the "Do" mantra. It is important to say it is neither deep nor high, somewhere in the middle. The inner feeling will tell you when you hit the right scale. 1. Sit upright, with a spine that is as correct as possible. 2. Breathe through your nose and hold your breath as comfortable as possible. Open the upper and lower jaw softly, forming a small space between the upper and lower teeth. Place the tip of the tongue in the so-formed space between the slightly separated teeth. 3. Apply a very slight pressure on your teeth. Then say the "Do" mantra at the same time, sigh slowly through the mouth. You pronounce a mantra once, after one exhale. While you are doing this, your tongue should vibrate between your teeth. Feel how the air moves and passes between your tongue and your teeth. If you apply this technique properly, you will feel pressure or sensations in your forks and faces. This spoken sound will also vibrate in your third eye. 4. Make this cycle, therefore, breath, hold the air and drop 4 times. 5. Do this exercise for 3 days in a row, therefore, only three times in total. That's enough to activate your Third Eye Chakra. • The next method for stimulating your third eye is so simple and you only need three things: will, confidence, and discipline. Use your favorite meditation technique to relax. Breathe; relax until you feel completely in meditation. Visualize the candle in front of you. The goal is to remain focused on the candle, regardless of everything. You will naturally visualize the candle in the area of the third eye and let me tell you - it sounds hundreds of times easier than it actually is. Your Ego will hardly accept the fact that you are trying to teach yourself discipline and focus and will continue to serve you all kinds of disturbances, just to distract you from the image of the candle that you are trying to hold in front of you. Perhaps you can think that you are not imagining a real candle or being too far or too close, but all you need to do is keep the focus, and it will eventually manifest. 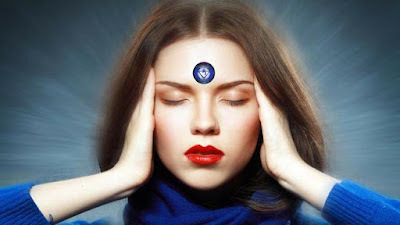 If you do not suffer from headaches, and in one period you are often subject to the same, maybe your third eye is preparing to connect you with higher self. If after leading meditation, kundalini yoga or the method for opening the third eye, there is a severe pain in the center of the forehead, visualization or light beams inside the head, which means that the third eye opens. The sight is clearer, you see the colors clearer, the smell and the taste are improving, and people heard the expressions. Dreams in this period are very expressive, simply realistic, clear, and dreams transpose visions or messages from the higher Self. When the third eye opens spontaneously, it greatly affects the sense of 'grounding' we have every day because we become aware of other parts of the reality that have nothing to do with the past awareness of the world in which we live. Often there is a sense of alienation from that primary meaning that we associate with things around us. With the opening of the third eye, there is an incredible ability to recognize the truth in others' words and actions. As a result, there may be turbulence in existing relationships, whether partnered, friendly or family, and lead to making our previous, strong links so superficial and insignificant. Lies can be easily observed and everyday delusions and deceit will become intolerable. At the mental level, intuition, creativity, orientation, and psychic abilities are present.